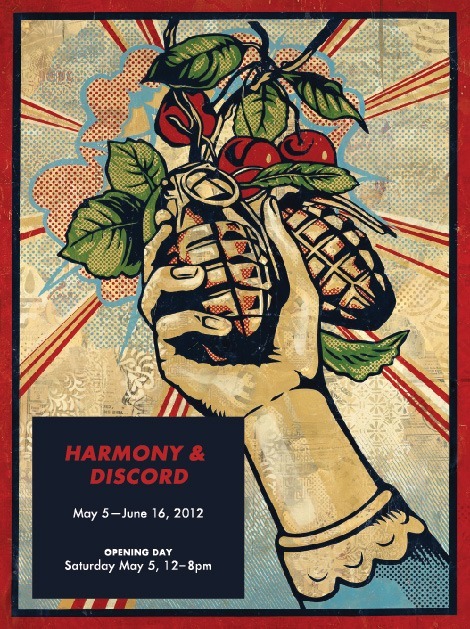 Pace Prints is pleased to present Harmony & Discord, an exhibition of new works by Shepard Fairey, created in the Pace Editions studios in New York. This is Shepard’s first exhibition with Pace Prints and premiers his first works in handmade paper as well as the largest screenprints he has done to date. Harmony & Discord references the global dichotomy of politics; what forces it creates on the grand scale and how that reflects on the actions and awareness of the individual. Responding to the energy of New York, Fairey worked on this technically complex body of work in a series of sessions at the Pace Editions studios. During this residency he also went out on the streets and made a number of large murals. On view will be a number of silkscreens done with collage and spraypaint, as well as handmade paper, embossment and relief prints, and large metal plates with screenprint. Though Shepard approached the work in the same way that he does in his studio, Pace Editions provided the opportunity to scale the work to a larger size. Relating to the surfaces of his street work, the hand painted multiple (HPM) works in this series have backgrounds of stenciled pulp, collage, screenprint and embossment, allowing the image to pop off of its vintage, layered surface. This exhibition also marks the first time Fairey presents metal relief plates as art pieces, layered with silkscreen, furthering spatial extent within the work. 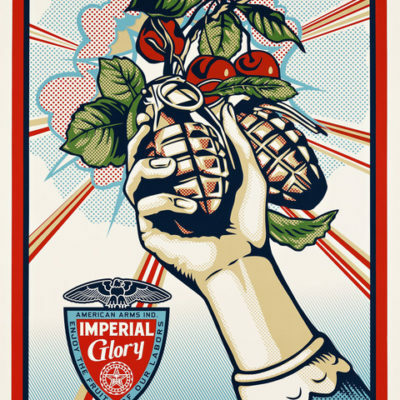 Subjects in the exhibition include Fairey’s Imperial Glory and Power images, both of which pay homage to Lichtenstein’s style while referencing issues of the military industrial complex. Also on view will be The Reagan and Friends series, depicting politicians and corporate bosses as manipulative salesmen. A more graphic grouping of works, which all utilize the target as a device, examines symbols, stereotypes and propaganda. Topics include war and peace, political corruption, global warming, and personal empowerment and responsibility.